This theatrical monument to the memory of great German ophthalmologist Albrecht von Graefe can be admired in the Charité (Berlin), at the corner between Schumann- and Luisenstrasse. 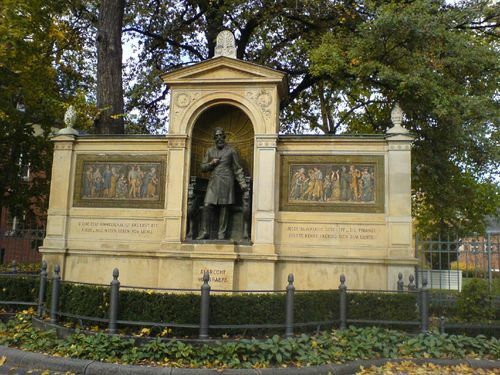 The initiative for the monument came in 1872, two years after von Graefe's death, and was supported by physicians and ophthalmologists of several countries. Also Rudolf Virchow was involved in the committee. The inauguration of the Graefe-monument, masterpiece of the sculptor Rudolf Siemering, took place in 18821. 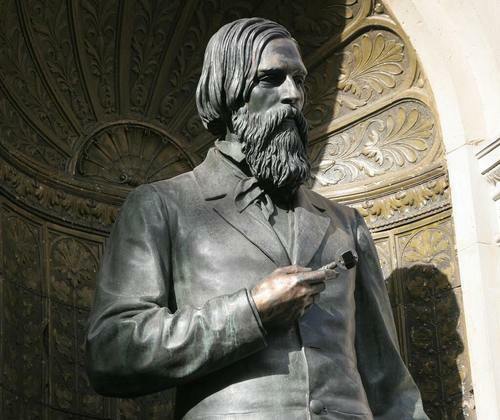 In the monument, von Graefe keeps in his right hand an ophthalmoscope, as a memory of the fact that he "was among the first ophthalomologists who regularly used the ophthalmoscope of Hermann von Helmholtz for the diagnosis of the fundus oculi when going on their ward rounds"2. 2. W.F.Bynum and Helen Bynum, Dictionary of medical biography, Greenwood Press, Westport (CT) 2007, vol. 2, p. 571.